Many observers are tempted outside again when temperatures start getting milder. The night sky shows us a completely different aspect in Spring. But what is there to observe? What is there worth looking at? 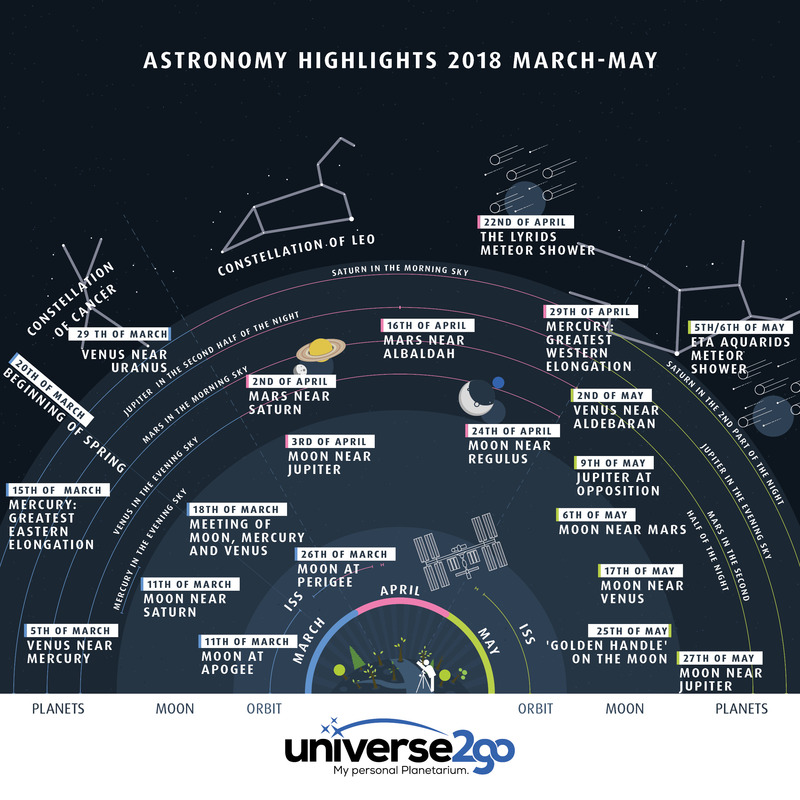 Here is the astronomical calendar for the next three months – The new astronomical ‘Highlights in the Spring Night Sky’ infographic shows you at a glance what is happening in the night sky during the months of March, April and May. Venus greets us as the Evening Star again this month. We find it at dusk, deep on the western horizon. But another planet can also be seen in the first days of March – Mercury. This nimble planet keeps Venus company and is an opportunity for us to marvel at the two innermost planets. 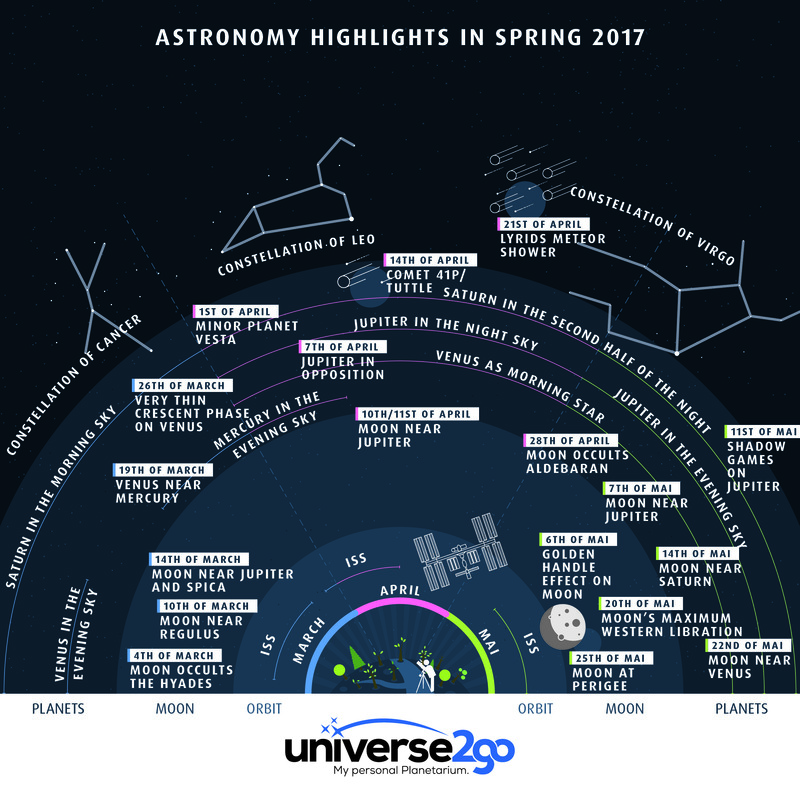 Most observers like to use the evening hours for observing the night sky. But anyone who does not get up early this month will miss a special show – The three planets Saturn, Mars and Jupiter all shining in the early morning sky. The Moon nears the gloriously ringed planet on the 11th of March, getting to only about 1.5°away. Observers will have a fantastic sight thanks to the waning crescent Moon. The moon does not orbit the Earth in an exactly circular orbit, but rather in an ellipse. This means that in the course of a month it can reach a particularly close or an especially distant position. At 403,000 kilometres away, the Moon is smaller today than usual, with an apparent diameter in the night sky of about 29″. Mercury is the fastest orbiting planet in our solar system. But we do not often get an opportunity to observe it well as it always stays close to the Sun. On the 15th it will be at 18.4°away – its greatest angular distance to the Earth. It can be observed at a comfortable height above the horizon between 18:45 and 19:30. Mercury and Venus are now striking objects in the evening sky. And, on March 18th, an extremely delicate and only 1.6% illuminated crescent Moon joins them. An optimal opportunity for taking an atmospheric photograph at dusk. While the Moon was at apogee on March 11, it now reaches perigee – its nearest distance to Earth. And, at a distance of 366,000 kilometres, it also appears a bit larger. Both Venus and Uranus in the field of view? Few have probably seen this before. But today it is really possible. Then the two planets are only 42 arcminutes apart. Near enough together to observe both of them together in a 2″ wide-angle eyepiece. Mars is the ‘star‘ of 2018. It is slowly preparing for its big show – its opposition in June. By now it is as bright as the brightest stars in the sky. We can find it on the left above the ‘teapot’ in the constellation of Sagittarius. The Red Planet meets with Saturn at the beginning of the month – on April 2 they are about 1° away from each other. Jupiter competes with Venus with a brightness of -2.39 magnitude. Jupiter is one of the most striking objects in the sky even if it does not quite match Venus. The Moon is only at 5° away from it today. It’s always nice to see two bright astronomical objects close to each other. Such alignments in the night sky are noticeable because they are particularly unusual. On April 16, Mars and the star Albaldah make such an alignment. This star is occasionally occulted by a planet due to its location very close to the ecliptic – this will next occur on 17 February 2035 at 16:32 CET, when Venus will occult Albaldah. But this will not be visible from Central Europe as Venus is below the horizon by then. The Moon passes close to the star Regulus today. We can observe this tonight as the Moon approaches and then recedes from Leo’s brightest star. Regulus and the Moon are separated by 42 arcminutes at 21:00. At 23:00, they approach within 14 arcminutes, but an hour later the separation has increased again to 27 arcminutes. The Lyrids are a meteor shower, which reaches maximum at only 10 to 20 meteors per hour on the 21st of April. But the optimal observing time is between 22:00 and 4:00 in the morning, when they can be observed undisturbed by the Moon. The shower’s radiant lies in the constellation of Lyra. Mercury orbits fast, whizzing around the Sun in just 88 days. At the beginning of the month it was at greatest western elongation to the Sun, which gave us a good evening visibility. At the end of the month it will reach its greatest eastern elongation. In such cases, Mercury can be seen in the morning sky. Due to the shallow inclination to the ecliptic, Mercury remains near the Sun and is not visible at dawn. Two bright objects shine at dusk close to the western horizon – Venus and Aldebaran. The red giant is 150 times brighter than the sun. At a distance of 67 light-years however it only reaches an apparent brightness of 0.85 magnitude as seen from the Earth. Even so, it is one of the brightest stars in the night sky. It makes a beautiful sight together with Venus. We see again a meteor shower in the second half of the night. The Eta Aquarids appear to originate from the constellation of Aquarius and describe long, bright trails in the night sky. However, the Eta Aquarids do not ‘wake up’ until around 3 o’clock, which puts them only just above the horizon in Central Europe. There is still the chance of catching some bright meteors even so. The average rate is between 20 and 60 meteors per hour. Another highlight in the early morning sky is a close encounter between the Moon and Mars. The two are separated by just 3° this evening. The 69% illuminated Moon first appears over the southeast horizon at about 1:30. The planet Saturn can already be seen by then to the right and above. The red planet follows the Moon about half an hour later, at 2:00. They can be observed almost exactly in the south until sunrise. A beautiful sight – The constellation of Sagittarius framed by three celestial bodies in the solar system. When evening comes, the largest of all planets peeks over the horizon. Jupiter is today at opposition to the Sun. That means the Earth is exactly between Jupiter and the Sun. The gas giant can now be seen all night, reaching its maximum brightness and appearing particularly large – an optimal chance to admire it with binoculars or a telescope. Jupiter reaches its highest altitude shortly after 1:00 AM and crosses the meridian. The already low-lying planet is best observed now. A delicate crescent moon and a radiant Venus at dusk – you can observe this beautiful event on 17 May. Today, the Moon moves past the Earth’s sister at only 5° away. Astronomy in the early evening! The ‘Golden Handle’ can be seen on the Moon tonight. Appearing like a ‘handle of light’, it ‘breaks out’ of the dark part of the Moon just beyond the terminator. The Sun is already illuminating the peaks of the Montes Jura surrounding the Sinus Iridum crater when this is still in the dark – visible between 16:30 and 20 o’clock. The Moon is near to Jupiter this evening. It approaches to within just over 2.5° at 21:30. It is a meeting of two beacons – the Moon and Jupiter are now the brightest objects in the sky.